I spent the day by a stream last Saturday. I sat there doing nothing just listening to the birds sing worship in the trees and the wind whistle it’s praise through the branches. I sat there and I thought, “I should do this more often”. I should put down my phone, leave my laptop at home and my to-do list on my desk and just give my soul time and space to rest, to just be with God. 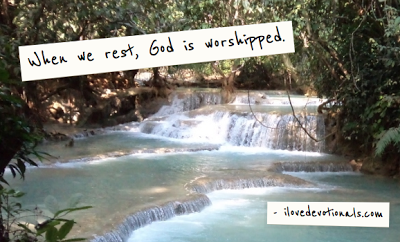 I shouldn’t be so afraid to declare those quiet, restful moments as holy. I realized as I sat beside the rushing water that this moment of silence and solitude was as holy as any I’ve spent with a bible in hand or lending a hand to the poor. I was throwing my hands up, saying I couldn’t do it all, and resting in the knowledge that God is in control. I was declaring in that quiet moment that I trust God to handle my worries and fears and concerns. When was the last time you took time out to just let your soul rest with God? Stop and ask God to show you a moment in your schedule where you can just rest. If you enjoyed this please subscribe to receive these devotionals via email or tweet this or share it on facebook. A version of this devotional originally appeared in my column on Gateway News. Ever Wondered Why Birds Fly? Where Is God In Unknowns & Questions?